The7 4.2.3.1 newest version : Released on July 3rd, 2014. 100% compatible with WordPress 3.9.1! Create any layout with Visual Layout Builder! The7 comes with Visual Layout Builder. Create almost any layout you can imagine in only couple of clicks! We’ve included 6 ready-made skins in different color schemes for different purposes. They can be a great starting point for your unique custom design. Enable / disable top bar, header, floating menu, bottom bar. Use custom logos, logo links and favicon. Enable / disable beautiful page loading. Choose wide or boxed layout. All regular options like header, slideshow, sidebars etc. settings are also available. New! We supercharged WP Custom Menus (now it’s Mega Menu)! Icons (custom images or icon-font). Multiple menu rows / columns. Enable / disable frames & backgrounds in main menu. Enable / disable arrow level indicators for main menu and drop down menus. 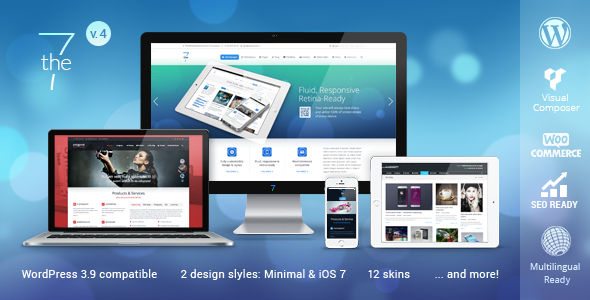 Fancy headers, fullscreen slideshows, Revolution Slider, boxed and wide layouts, striped content backgrounds, parallax stripes, floating menu, and more… much more! plus enable or disable sidebar. Build any layout you can imagine with wide range of shortcodes: Accordion, Toggles, Tabs, Banners, Teasers, Call to action, Benefits, Blog, Buttons, Clients, Contact form, Map, Photos, Pricing tables (via plugin), Progress bars, Portfolio, Slideshow, Social icons, Stripes, Testimonials, Team, etc. 12 amazing skins for different purposes included. Fixed: problems with elements animation and FontAwesome rendering. 1. Fixed: issue with photos/portfolio scroller in Safari. 2. Fixed: Porthole slider thumbnails disappeared.